Cucumber beetles and bacterial wilt are major constraints to production of cucurbit crops. 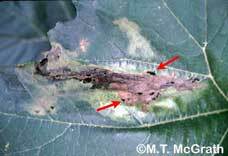 Striped and spotted cucumber beetles (Figures 1 and 2) can cause extensive damage by feeding on leaves (Figure 3) and rinds of cucurbits, but they have a greater impact on yield when they transmit bacteria that cause bacterial wilt (Erwinia tracheiphila). 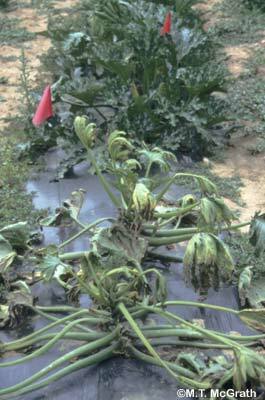 Affected plants exhibit leaf wilting (Figure 4) and eventual complete plant collapse (Figure 5). Bacterial wilt has been increasing in importance. Incidence and severity has increased in areas where it was endemic; and recently the disease has occurred in new areas, severely affecting crops previously thought to be moderately to highly resistant (especially pumpkin, summer and winter squash, and even some gourds). Until recently, bacterial wilt was virtually absent in Oklahoma and Texas. In 1998-99, cantaloupe, pumpkin, and squash were severely affected. In New York, bacterial wilt was long recognized as a routine problem for cucumber and melon, but beginning in the 1997 season, a dramatic increase in wilt was noted for summer squash and pumpkin. Historically, pumpkin has been considered substantially less susceptible to bacterial wilt than cantaloupe and cucumber. However, the trend for increased disease incidence in pumpkin has been noted in other areas of the United States. The goal of this project was to determine if cucurbit crop types and varieties differ in their attractiveness to cucumber beetles and susceptibility to wilt. Observations of more wilt in powdery mildew resistant (PMR) pumpkins, suggesting greater susceptibility, was specifically addressed. Without information on host susceptibility, growers are compelled to use the same insecticide program for all varieties because of the potential impact of wilt. 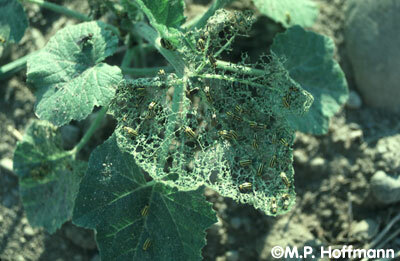 Application of insecticides to control cucumber beetles is the main management practice being used for wilt. 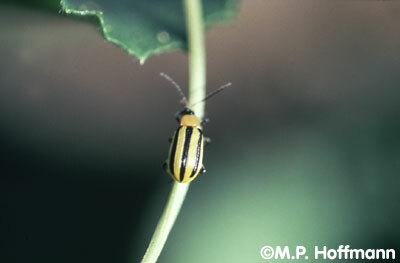 Experiments were conducted in 1999 and 2000 under natural infestation of striped and spotted cucumber beetles at the Long Island Horticultural Research and Extension Center (LIHREC) in Riverhead, New York. Seedlings were transplanted 9-11 June, which was less than 2 weeks after seeding, so that they would be in the field almost their entire life including the cotyledon to first leaf stage when cucurbit crops are highly attractive to cucumber beetles. No insecticides were applied. Plants were examined weekly for cucumber beetles, feeding damage, and symptoms of bacterial wilt. Representative wilted plants of each variety were examined microscopically for bacteria in the vascular tissue to confirm wilt was due to bacterial wilt. Generally, crops and varieties with the highest density of cucumber beetles and the most feeding damage subsequently had the highest incidence of bacterial wilt. The gourd Turk's Turban, the winter squashes Golden Delicious and Blue Hubbard, the yellow summer squash Goldbar and the muskmelon Athena had more beetles, feeding damage, and plants with wilt than other varieties of these cucurbit crops types that they were compared to (differences were not always significant). However, attractiveness to beetles was not always related to wilt susceptibility. 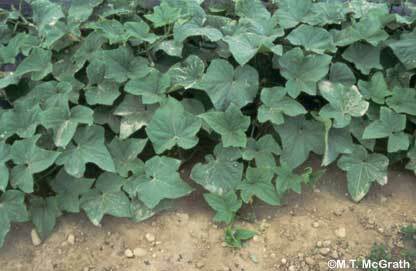 For example, although fewer beetles per plant were observed in cucumber than in most other cucurbit crop types, and little feeding injury was observed, a higher percentage of cucumber plants developed wilt. 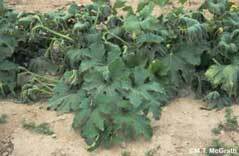 Muskmelon had similarly low beetle densities but less wilt than cucumber. Compared to cucumber, zucchini was more attractive to beetles and less susceptible to wilt. Pumpkins Howden and Harvest Moon had higher beetle infestations but lower incidence of wilt than PMR Merlin. Gourd. Turk's Turban (Cucurbita maxima) was very attractive to beetles and was severely affected by wilt, differing substantially from Pear Bicolored (Cucurbita pepo)(Figure 5). This documents an important difference between these species that most likely extends to other gourds. Initial symptoms of wilt were first seen 13 and 19 days after cucumber beetles were first seen in 2000 and 1999, respectively. Turk's Turban plants succumbed quickly: most plants were severely wilted just 3 days after symptoms were first seen in 1999. In the absence of insecticide treatment, all Turk's Turban plants died before producing fruit while 23-28% of the Pear Bicolored plants died by late August in both years. Figure 4. Initial symptoms of bacterial wilt include wilted sections of leaves. Sometimes holes from cucumber beetle feeding are evident. Figure 5. Severely wilted plants in the foreground are the gourd Turk's Turban on 24 July 2000. Healthy plants behind are the gourd Pear Bicolored. Cucumber. The pickling cucumber County Fair, which is reported to be wilt resistant, was substantially less susceptible to wilt than the other two varieties examined (Figure 6); 7% wilted versus all Dasher II and Calypso plants wilted by 22 Aug 2000. Similar to pumpkin, this was not due to differences in beetle attractiveness as there were no significant differences among cucumber varieties in number of beetles/plant or amount of feeding damage. Figure 6. 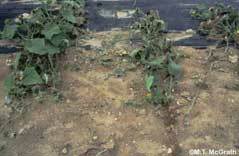 Wilted plants of cucumber Dasher II (left) and healthy plants of County Fair (right) on 24 July 2000. Muskmelon. No significant differences were detected in beetle attractiveness or wilt susceptibility among he three varieties examined, Athena, Eclipse, and Saticoy. Watermelon is considered not susceptible to bacterial wilt. It is also less attractive to beetles than most other cucurbit crops. The few plants that wilted in 2000 may not have been affected by bacterial wilt because bacteria were not observed in the vascular tissue of any of the watermelon plants examined, in contrast with the other cucurbit crop types. Pumpkin. 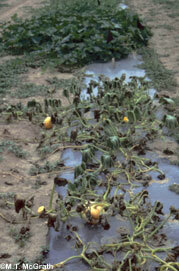 Differences in wilt occurrence were detected among pumpkin varieties (Figure 7). This was not related to attractiveness to cucumber beetles or to damage from their feeding, which suggests these varieties differ in their susceptibility to wilt. A high percentage of Merlin plants developed severe wilt (at least 50% of the plant affected) by late August in both years (89-97%). Magic Lantern was also severely affected in 2000 when insect and disease pressure was higher than in 1999 (98% in 2000 versus 22% in 1999). These varieties did not have more beetles per plant or more feeding injury than Harvest Moon and Howden. Percentage of plants of these varieties that were severely wilted was 3% and 13% in 1999 and 53% and 58% in 2000, respectively. Figure 7. Wilted plants of pumpkin Merlin (left) and healthy plants of Howden (right) on 24 July 2000. The more susceptible varieties have powdery mildew resistance (PMR). Fortunately there does not appear to be a general correlation between wilt susceptibility and PMR as the PMR muskmelon and yellow summer squash varieties examined in this study (Eclipse, Athena, and Sunray) were not more susceptible to wilt than the other varieties examined. More research is needed to determine if greater wilt susceptibility occurs in other PMR pumpkin varieties. Figure 8. Wilted plants of Multipik on 24 July 2000. Figure 9. Wilted plants of Ambassador on 24 July 2000. Winter squash. 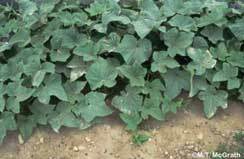 Waltham Butternut (C. moschata) had fewer beetles and less feeding damage than other winter squash varieties, and it was the last to develop wilt symptoms, hich were not seen until 15 Aug 2000. No symptoms of wilt were seen in 1999. It was less susceptible than Golden Delicious or Blue Hubbard; Table Ace and Burgess Buttercup were intermediate. Differences exist among cucurbit crop types and varieties in attractiveness to cucumber beetles and susceptibility to bacterial wilt. With the information from this project, growers can adjust their management program for cucumber beetles and wilt, thereby increasing their profitability and reducing insecticide use with some varieties. For example, the pickling cucumber County Fair was considerably less susceptible than the pickling cucumber Calypso and the slicer Dasher II, even under the high insect and disease pressure that occurred in this experiment. 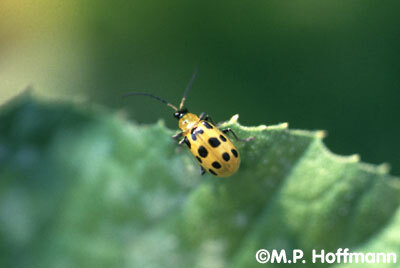 It could be grown without applying insecticides for cucumber beetles. On the other hand, the gourd Turk's Turban was very attractive to beetles and highly susceptible to wilt. Growers have complained that plants of this variety tend to die prematurely; results from this work reveal why. 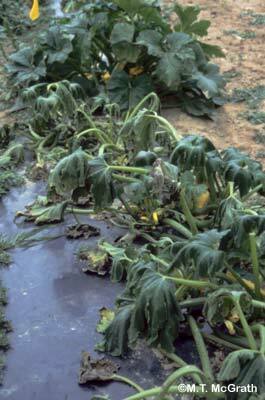 A more intensive insecticide program needs to be used with this variety where wilt occurs. 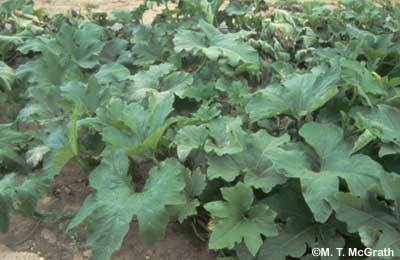 An action threshold for foliar insecticide application of 1 beetle/plant is sometimes recommended for cucurbits. However, it may be too high for crops such as cucumber and varieties such as Merlin pumpkin that are highly wilt-susceptible when the pathogen is present and fields are monitored weekly considering the high incidence of wilt that occurred although this threshold was not reached in either cucumber variety or in Merlin in 1999. McGrath, M.T., and Shishkoff, N. 2000. Comparison of cucurbit crops and varieties for their attractiveness to cucumber beetles and susceptibility to bacterial wilt, 1999. Biological and Cultural Tests 15:154. McGrath, M.T., and Shishkoff, N. 2001. Comparison of cucurbit crop types and varieties for their attractiveness to cucumber beetles and susceptibility to bacterial wilt, 2000. Biological and Cultural Tests 2001:V86. McGrath, M.T. 2002. Attractiveness of cucurbit crop types to cucumber beetles and their susceptibility to bacterial wilt. Pages 222-227 in Cucurbitaceae 2002. D. N. Maynard, ed. ASHS Press. Table 1. Density of cucumber beetles and incidence of bacterial wilt for various cucurbit crop types and varieties in 1999.
a For crops or for varieties within a crop, numbers in a column with a letter in common (w-z for crop type and a-c for variety) are not significantly different according to Fisher's Protected LSD (P = 0.05). Varieties with no letters had a P-value too high to merit a comparison. Table 2. Density of cucumber beetles and incidence of bacterial wilt for various cucurbit crop types and varieties in 2000.